Sunsets along the lush coastline of Punakaiki on the West Coast of the South Island of New Zealand are exceptional especially when the rays from the sun glisten off the Pancake Rocks. Rocks line the coast near Punakaiki on the West Coast of the South Island of New Zealand which resemble that of pancakes due to the flatness that they possess. All the rocks stand in a unique rock formations and when the sunset illuminates the New Zealand sky, the tops of the Pancake Rocks soak up the sun's rays. Punakaiki, New Zealand has become famous because of the Pancake Rocks which are made up of limestone that began to form approximately thirty million years ago. When sea creatures expired, the lime fragments from these animals were left along the seabed and mud and clay formed atop of them.After many earthquakes, the seabed continued to rise well above sea level and the various weather patterns that swept through New Zealand carved out the layers that appear on the Pancake Rocks. Photo of Pancake Rocks and the blowhole which are spectacular sights to see in Punakaiki on the West Coast of New Zealand. ... In the midst of the pancake rocks, there is occasionally a spray of water that can explode upwards and create huge spouts of water. This is known as a blowhole and these intriguing displays happen at high tide when the waves of the ocean are strong enough to force themselves into the underground caverns below the rocks and in turn, the water shoots upwards. To view the Pancake Rocks, there is a hike that takes you from the main road, along scenic trails surrounded by native rainforest and then you approach the coastal plant life as you near the coastline. 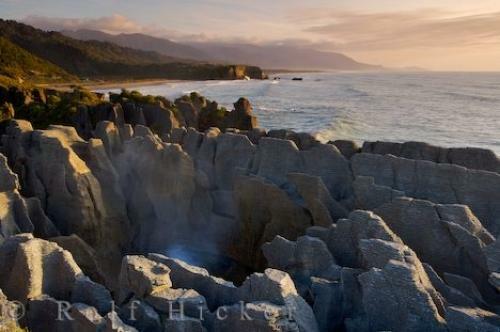 There are many places to stop along the way that have outstanding views of the Pancake Rocks, the blowholes and stunning views of the Punakaiki coastline. Some of the prettiest New Zealand sunsets can be seen and photographed from these lookout areas. and if time allows, another trail that is a short distance away, leads you to Punakaiki caverns. Other trails will take you on the river hike, while longer trails lead you to caves and to the early gold miner days. The Pancake Rocks and the blowholes of Punakaiki, New Zealand are spectacular to see and every tourist to this area should be sure to explore them as well as the fabulous rainforests, stunning mountain tops and the beautiful beaches that reside along the rugged coastline. Make sure to look at our collection of sunsets. Sunset at the Pancake Rocks at Punakaiki, West Coast, South Island, New Zealand. Paparoa National Park. I photographed this photo with the digital SLR camera model Canon EOS-1Ds Mark II, aperture of f/16.0, exposure time of 1/4 sec. on ISO 100, as always I used a original Canon Lens, the focus lenght for this picture was 34mm.